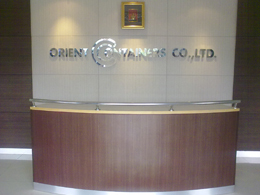 Orient Containers Company Limited was established under the solid foundation of Nam Chareon Limited Partnership which was founded in 1962. With the expertise, experience, and high technology machines, we have produced high quality corrugated sheets and corrugated boxes to fulfill the market demand for over 40 years. Today, Orient Containers Company Limited is operated by board of director with an initial registered capital of 60 million baht on the area of 51 rai in Samutsakorn province. Was established with an objective to launch a manufacturing of cardboard paper using advanced machinery for quality productionevery step of the way. providers integrated services to its clients – from consultant service to computer – aided design operation to meet the client’s utmost requirements. Strong quality control and in section unit ensures product durability and quality before delivery. In terms of human resources, the company continuously conducts personnel training in order to raise the service standards.